The AcuLink Internet Bridge will allow me to monitor the atmosphere of the coop from my phone. So I just ordered a gizmo that will allow me to track temperature and humidity in the chicken coop on my iPhone. Originally we had bought a La Cross Solar Powered Wireless Temperature Station. We selected this model because it boasted of a 200-foot wireless transmission range, which sounded perfect because the coop sits back about 80 feet. It would allow us to monitor the temperature of the coop on a base station inside our house. 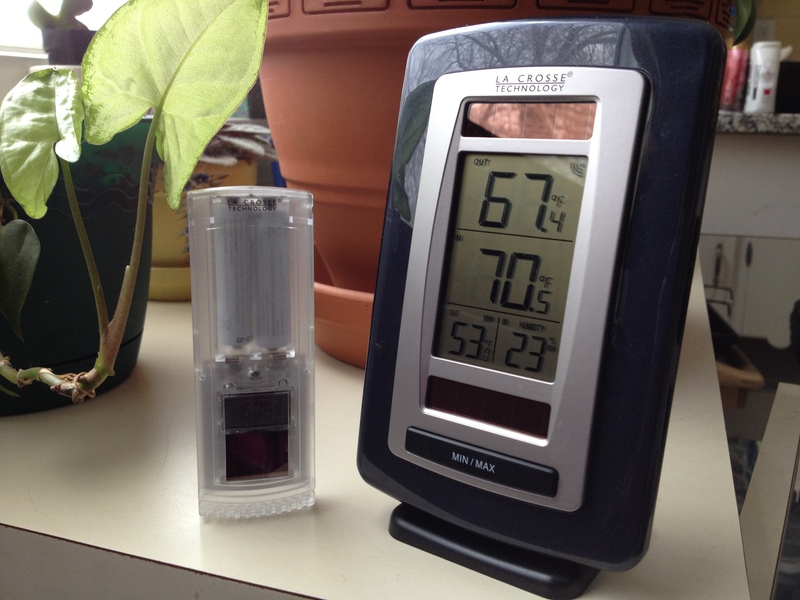 This weather station works well in the house, and even about 30 feet from the sensor. But from inside the coop to the house? Not so much. Yesterday we installed the sensor inside the coop, and turned everything on. At first it seemed to work. It registered the outside temperature while we were still out there, then went back in the house. After about 15 minutes, though, the outside temperature on the base station failed to register a reading. I decided to troubleshoot by resetting the station, moving the coop sensor to a different spot, turning the base station so it faced the coop. Nothing worked. At one point I walked out to the coop, and it picked up a signal about 30 feet away. But as soon as I walked back into the house, it stopped working again. When I investigated online, I found many people experienced trouble getting an outside read if the sensor had to travel through a wall. Apparently we really have built the coop like Fort Knox, because that sensor could not penetrate it. So I went into all-out investigation mode. 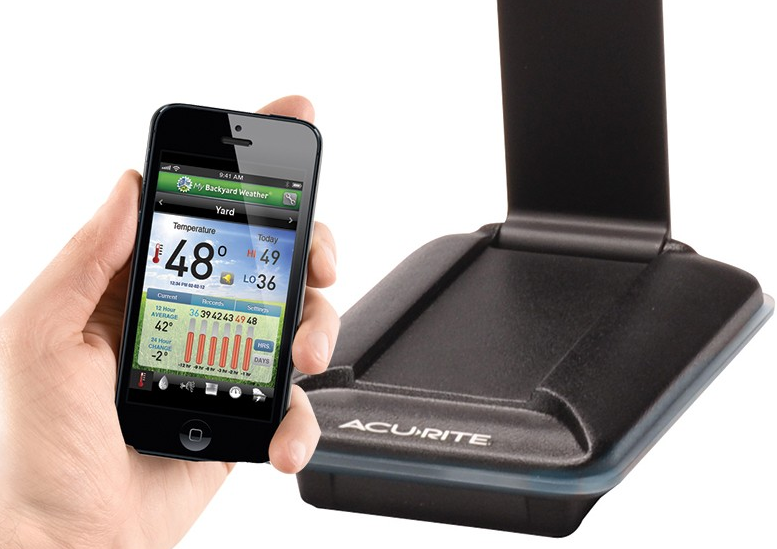 The AcuLink Internet Bridge: Remote Monitoring Online & Mobile App will do exactly what I wanted, but much, much more. It will measure the temperature in the chicken coop, and allow me to monitor using either my computer or iPhone. The program also will display the coop’s humidity level, which is helpful since high humidity could be disastrous for chickens. I should also mention that I called AcuRite customer service to make sure I was buying a product that would work with my yard. The woman I spoke with was very kind and helpful. She said the sensors have strong signal penetration, and she knew of several customers who used them with their chicken coops. That conversation basically sealed the deal. I ordered the AcuLink Internet Bridge and three sensors, one for inside the coop, one for outside the coop and one for inside the house. Overkill? Perhaps. But I guarantee it will buy me a piece of mind. In the end, the La Cross weather station will still come in handy. Since it works fine in the house, I plan on using it to monitor the temperature of the brooder once we get chicks. The temperature (with the help of a heat lamp) will be at 95 degrees the week we bring them home, then reduce in 5-degree increments weekly until they are ready to go outside (around 70 degrees). Speaking of all things technology, we also are investigating webcams for the coop. I can’t even imagine how cool it would be to check in on the birds from afar. Like I said. I’m a geek. Wow, thanks so much. I’m very encouraged, and excited to get my system in the mail. I can’t wait to update you on how it works, especially once we get the chickens in the coop!